It was dry today for the first day this last week, but more notably, it was sunny and warm too. Lots of the bees were out just after lunch, so whilst the sun was out too, I had a look in the hive. My main concern was that last time I checked them, I could see no new brood and was worried the queen was not laying or worse had died over winter. However, after a quick look through the Super, I got into the brood box to see if I could find the Queen, or any brood. It was quickly apparent that there was brood, though, and so I knew the Queen was in there somewhere. As they were a bit agitated, I closed up the hive again, replaced the fondant I had been feeding them to get them going, put on the roof and left them to it. So now the thing is to let them get going over the next few weeks, then at the end of April I will have to keep and eye on them weekly to see if they start to make Queen Cells in the hive, as I think this Queen is due to be replaced. The new hive is ready to go out too, with the new stand made and the hive varnished. 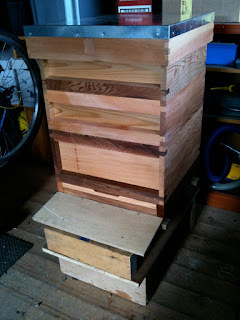 I shall keep my fingers crossed for a swarm soon!